Set Goals Not Limits provides running training by Coach Doug Butler. 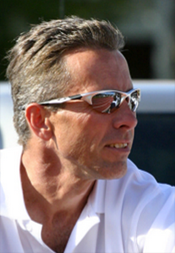 Coach Butler has a passion for running and years of proven successes, both personally and professionally. He uses this knowledge and experience to help others realize their running potential. Having his Masters in Psychology with a specialization in Sports Psychology he also taps into the mental side of training, which is, in his estimation, 90% of the game. Coach Butler began running in 1983 while stationed in Germany with the U.S. Air Force. Since then he has logged over 70,000 miles and hundreds of races. He has completed over 20 marathons with a lifetime best of 2:25:57. During his elite running career, he has won the Track Shack Grand Prix Series a record-tying five times (Track Shack, Orlando, FL), and eight-time Space Coast Runner of the Year Champion (Brevard County, FL). He has been inducted into the Space Coast Runners Hall of Fame and is a Space Coast Sports Hall of Famer. Coach Butler, a USAT &F certified coach, began coaching High School Cross Country and Track in 2000. Since that inaugural year he has coached his boys and girls cross country teams to a record-breaking 16 Florida State Team Championships along with many Individual State Titles. He has also coached his boys and girls Track & Field teams to 6 Florida State Championships. Coach Butler is the winningest FHSAA cross country coach in Florida’s history. He has been invited to speak on many expert panels at FACA and FHSAA coaching conventions and running camps. Coach Butler has been successfully training runners of all ages for over 15 years. He has coached legions of runners in all distances and provided training that has led to personal successes for many adult, high school and younger age runners. His passion for running and his ability to relate to runners of all ages are his greatest strengths in his coaching. Many of those high school athletes have gone on to successful college careers. He has also coached individuals to lifetime PRs (personal records,) coached runners to qualify for Boston & New York City Marathons, coached off-season college soccer athletes—anyone seeking to improve their fitness levels through running. © 2014 Set Goals,Not Limits,Inc.